Yesterday was a busy one! And I’m actually kind of excited to share some of it today. Not because it was glamorous or exciting, or the picture of perfection. In fact, it’s sort of the total opposite. But sometimes, that’s the stuff I like sharing because it’s the real stuff. The unstaged, probably not so healthy, and “oops” moments that remind us all that nobody’s perfect. Right? I logged into work around 7am to take care of a few things before getting Lucas up and ready for the day. A little while later, it was time for breakfast, which was fairly simple. 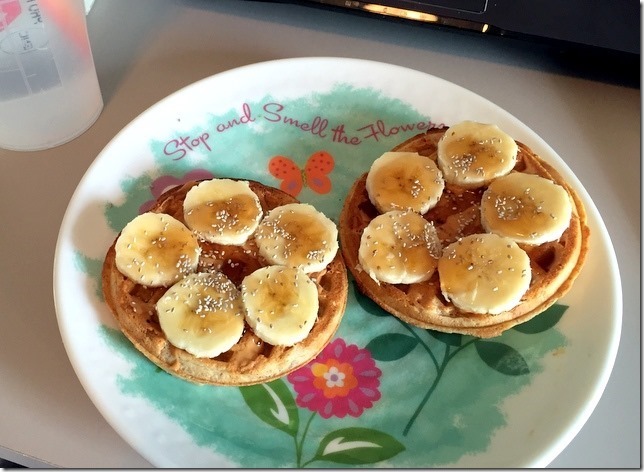 It was my work from home day, so I enjoyed a couple of toasted waffles with peanut butter, banana slices, chia seeds, and a drizzle of maple syrup. No coffee because it didn’t sound that appealing and I really didn’t feel like making it either. I kept at the work throughout the morning and conferenced in to a meeting around mid-morning, which was fairly productive. I followed that up with an orange and a couple random handfuls of almonds while standing in the pantry. 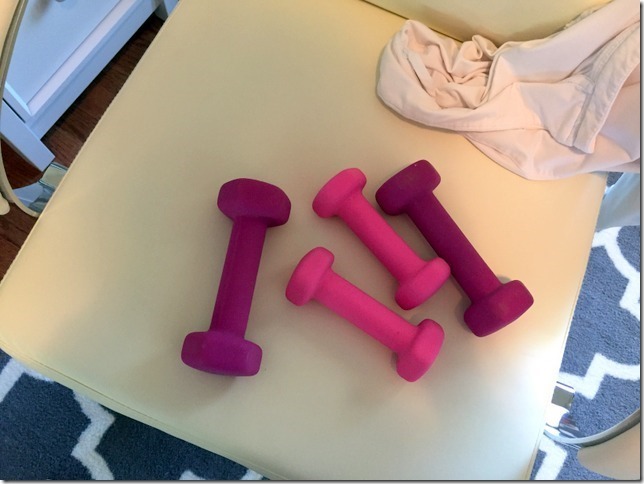 Around noon, I realized I should really move a bit, so I turned on a quick, 12 minute arms workout from Jessica Smith TV. I was too lazy to go down to the basement to grab my 5 pounders, so I paired my 3’s and 2’s to make 5’s. And, my goodness, 5 pounds feels heavy right now. I got back to the work thing and also wound up grabbing the attention of the landscapers who were next door to try and talk to them about some dead bushes (which were only planted when we moved in back in August). Apparently those bushes are well liked by the deer, and they’ve since died because the freakin’ things won’t stay away. Which reminded me that I need to get some more human hair from my mom (hairdresser, for those of you who may not know) to spread around the bushes (it deters the deer away, FYI!). Before I realized it, it was 1pm and I needed to get out the door for my doctor’s appointment/ultrasound, so I signed off of work for the day (the appointment was due to take a little longer) and got ready to go. I wasn’t super hungry but figured I should eat something. 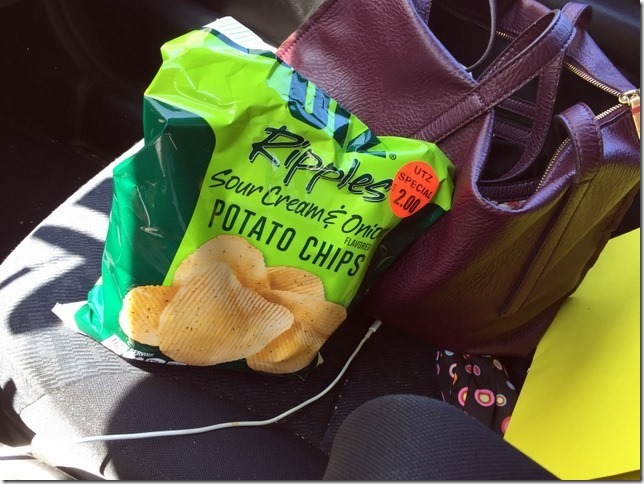 So I went the obvious, most healthy route, and grabbed the bag of sour cream and onion chips that were in the pantry. 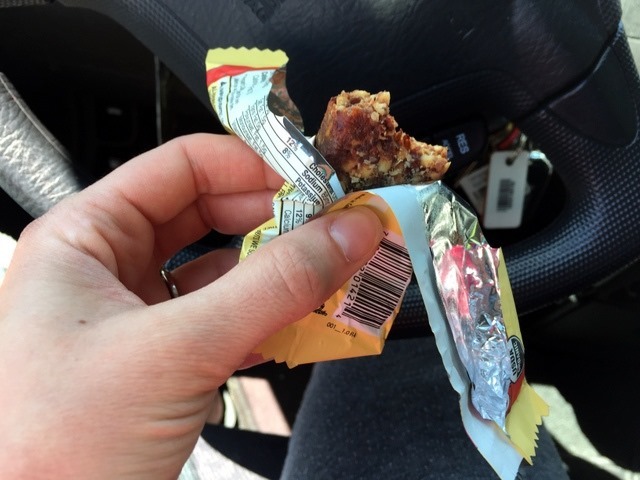 Luckily, I remembered that I had a cashew Clif Kit’s Organic bar in my purse, so I ate that first on the way to the appointment. Again, I wasn’t really all that hungry, but knew I needed to eat something. My hunger is all over the place these past few days (starving/no appetite at all). Jay joined me for my ultrasound, where it appears that baby boy is measuring at about 7lbs right about now…at 37 weeks. Yikes. Sure, there’s room for error, but I’d be lying if I said that didn’t make me a wee bit nervous about his final size. My fluid levels are still a bit high (up from 21 to 23) so they’re going to continue to monitor me. The tech mentioned something about high fluid levels being a sign of gestational diabetes, and I was like wait, whaaaaat?! So I double checked with my doc when she came in, they did a finger prick test, and my blood sugar levels were totally fine. Whew. 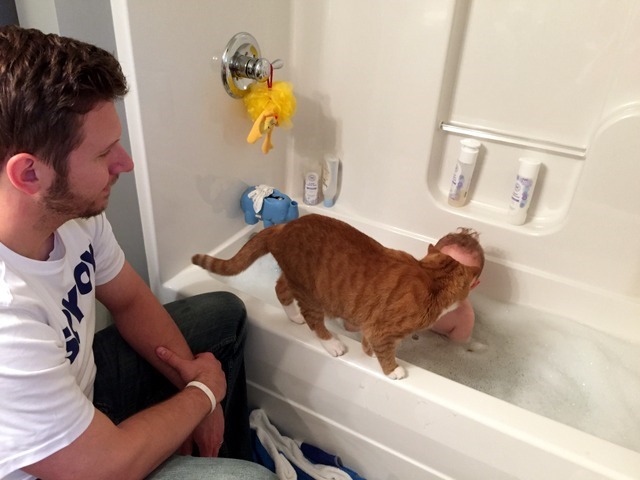 I guess I just like to grow babies that can do all sorts of swimming up in there? After the appointment, I chowed down on the sour cream and onion chips and don’t even want to know how many I ate. And then I stopped at Target quickly to grab some fruit and toothpaste (random, I know) before picking Lucas up from daycare. 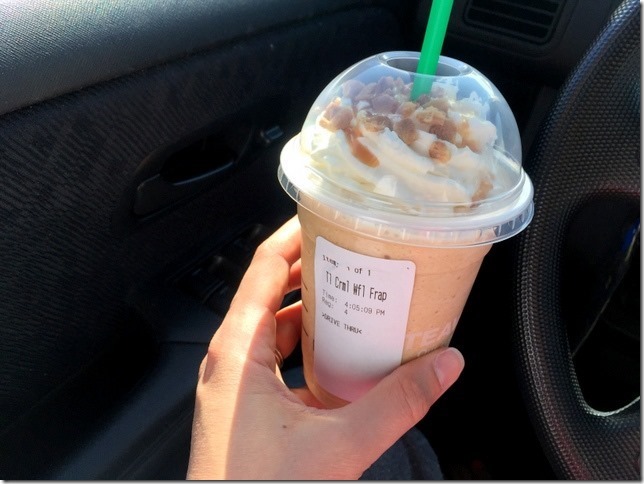 On our way home, we stopped at Starbucks because I’ve been wanting to try their new Caramel Waffle Cone Frappuccino. I even went all out with the whipped cream topping and all. It was a beautiful day yesterday, so we spent a good amount of the early evening outside. And, in this case, mowing the road. Then I realized it was getting close to dinner time for Lucas, so I lured him inside with an invitation to play a couple of letters and numbers game on the computer (aka, the “pooter, as he calls it). FYI: I found this website recently, and it’s a favorite of Lucas’s. 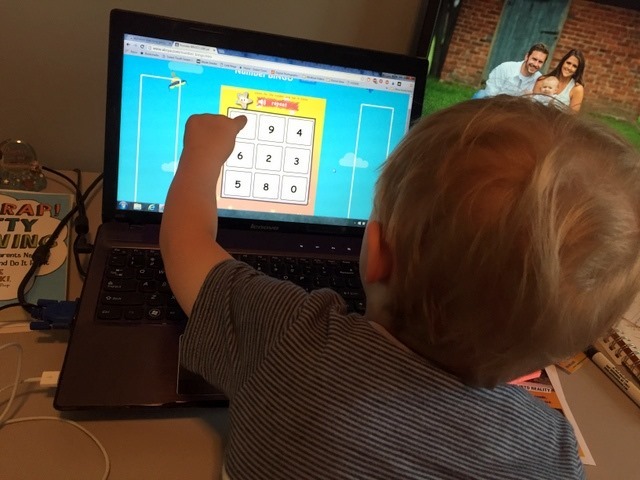 He likes doing quite a few of the letters and numbers games, with me using the mouse and him pointing to the screen! Awesome. 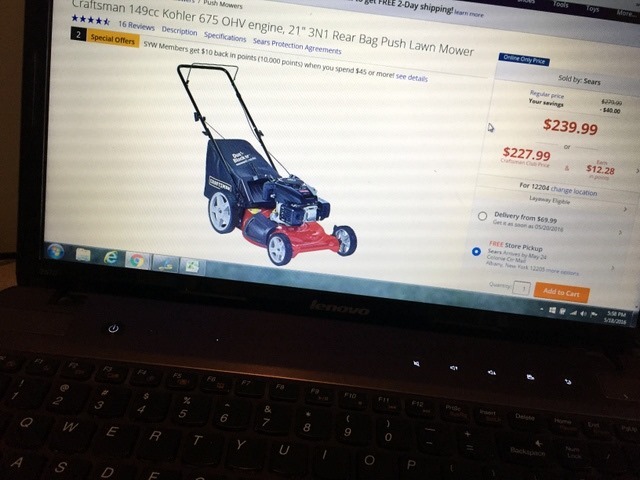 So back to the computer I went to find a new one to order from Sears. Ay yi yi. It’s always something, right? 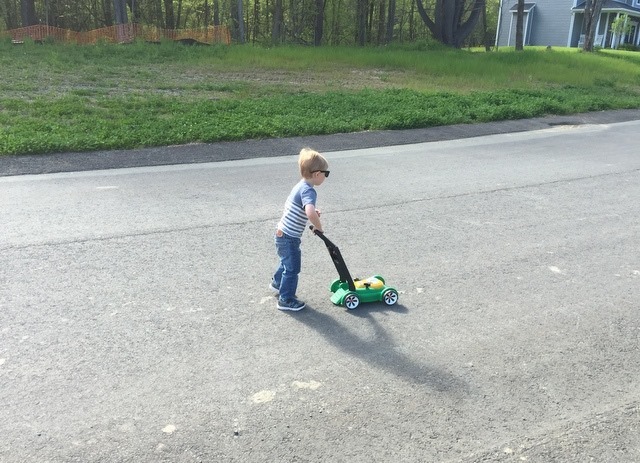 Jay then drove over to my parents’ house with a trailer to pick up our ride-on mower that had been hanging out there since we moved last year…and once he got started with that, Lucas had to be outside to watch daddy mow. 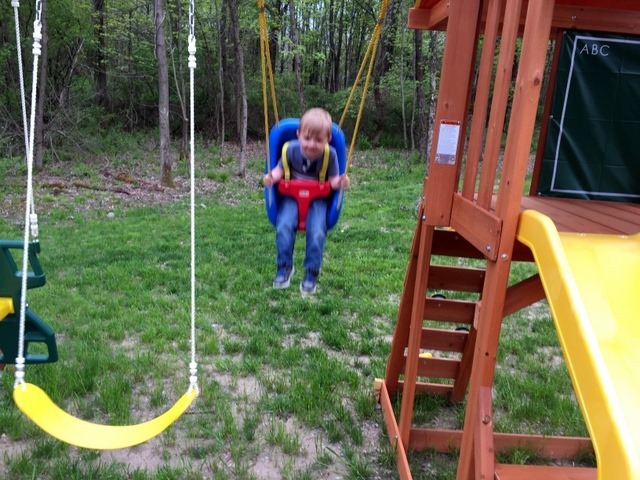 So on to the swingset we went! It didn’t last for long though, because a certain someone hadn’t napped at all yesterday and needed to be in bed early. So we headed up for a tubby. And, per the usual routine lately, Cody joined. By the time I put Lucas in bed and got downstairs, it was about 7:45pm and I realized that I hadn’t eaten dinner yet. Sheesh! I was finally starting to feel hungry, but nothing really sounded appealing (nor did I really feel like cooking) so I made myself a double egg + provolone sandwich. On a Christmas plate. And I wound up inhaling that in about 5 seconds as I started to type up this post. Now, it’s just after 8:30pm, I hear Jay coming in from finishing mowing the lawn, and I’m pretty sure I’m still hungry. I’m thinking that some yogurt + strawberries + chocolate chips may be in the cards right about now. So there’s a look at MY Wednesday! How’s your week going so far? Tell me something fun…like an “oops” you made? Or maybe a stellar meal that can compare to my lunch of chips? You've definitely dropped by the looks of the bump!!! Eeeek!!! That sandwich looks awesome! This post had me laughing through your entire day. Love the tip about hair on your plants, I had no idea! Yesterday I made up a word during a meeting. I've never done that before and have no idea where it came from! Red Pepper Flakes (like in the spice aisle) also works! That's what we used in our garden when the bunnies and deer were munching all of our flowers, and they left them alone after I sprinkled red pepper flakes around the plants! 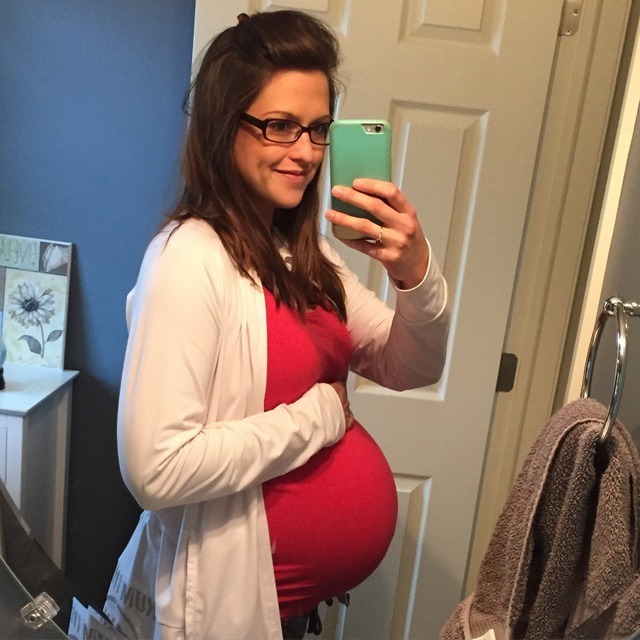 Everything sounds so exhausting to me, at 38 weeks pregnant! I am impressed with your workout. I get winded after about 5 minutes these days. Pregnancy brain is so real too- a little coffee wont hurt him ;) My little one calls it a pooter too. So cute. Haha the #oops and pregnancy brain are cracking me up! 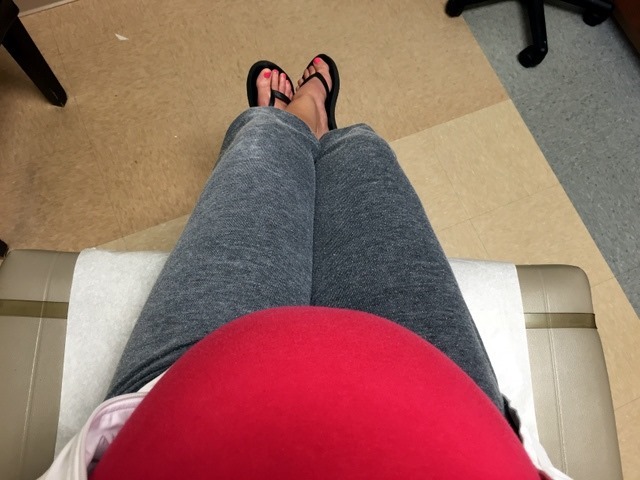 I am due with baby #2 in August, so I am about 25 weeks pregnant, and let me tell you that pregnancy brain is starting to rear it's ugly head! I prepped a meal on Monday for Tuesday and Wednesday's dinner. Well I took out half of it on Tuesday to reheat in the oven, and after it came out I took out a portion for my 18 month old daughter to let cool. Then, because my brain cells are totally working (HA! ), I grabbed the lid (that was still hot from the oven) with my bare hand, and when I realized what I had done I dropped the lid on top of the dish. The dish broke, sending shattered pieces of the dish onto my meal :( So I not only completely wasted half of the meal, but I broke one of my dishes too! Not fun! At least my daughter got to enjoy the meal, and we all got to enjoy the other half last night. 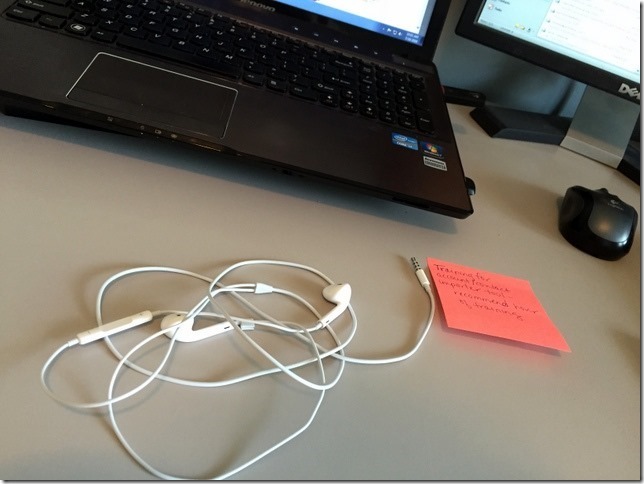 I made sure to concentrate the whole time so I wouldn't repeat my #oops! Haha Oh the joys of pregnancy at times! 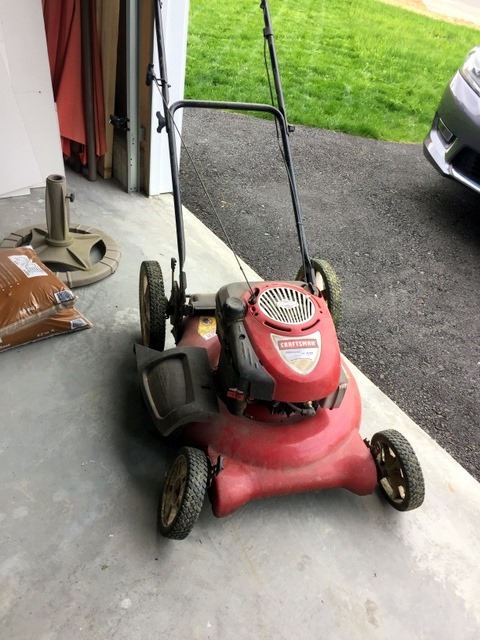 buying a lawn mower was SO low on my list of things for our new house. unfortunately, my husband disagreed. I feel ya on the frustration of the many "somethings" that seem to pop up :) I'm curious how Lucas did after the (accidental) caffeine? Guessing it wasn't enough to make a difference, though! I had leftover sushi for breakfast yesterday. Weird but delicious! Love these posts!! I have been loving roasted or grilled veggies on salads lately along with raw veggies. It is just a nice change with different textures. This might be an ignorant question, but is 7 lbs at 37 weeks too much or too little? Either way, I hope that weight ends up being okay! Your yikes made me worry! 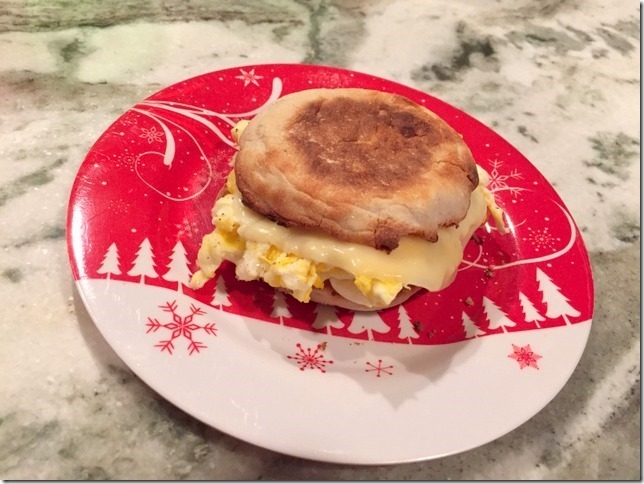 Egg sandwich on a Christmas plate LOL love it. 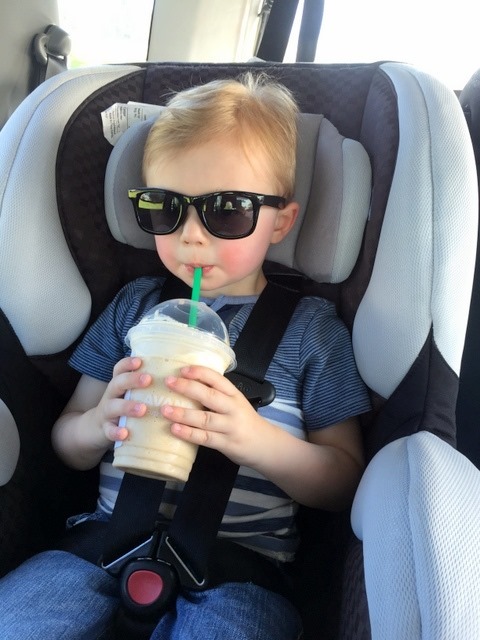 So how was that frapp?! It's been staring at me everything I walk in Starbs. Maybe today is the day to just say screw and give in. Heck, maybe I'll crumble some sour cream & onion chips on top ;) Have a great weekend, girl! I have that same Craftsman Lawnmower, and if it's just the wheels that are broken, it's fairly easy to repair! You can just order the new wheels (off Sears or Amazon) and it took my hubs less than an hour to replace them. Just a thought!